TRENTON — New Jersey's attorney general will give out more than half a million dollars in funding for police departments across the state to purchase body-worn cameras, his office said Tuesday. The announcement marks the second round of funding for the devices after the Attorney General's Office distributed $2.5 million last year, amid a climate of national scrutiny of police practices. "Police in New Jersey are embracing this technology as a way to build public trust through accountability, while also protecting and assisting officers in their difficult and dangerous jobs" Attorney General Christopher Porrino said in a statement announcing the new funds. "Every picture tells a story, and ultimately body cameras tell a story of better police-community relations." Proponents of the technology say the cameras keep both police officers and citizens who might make false complaints of abuse honest. What would it cost to put a camera on every cop? But there has been resistance in the state from some police officers and police chiefs concerned about the costs of the devices and the rules governing their use. Civil liberties advocates have also expressed concern about how the footage might be used, and who will have access. Earlier this year, two unions representing State Police troopers and commissioned officers fought unsuccessfully in court to overturn a 2015 directive on body camera use from the attorney general. 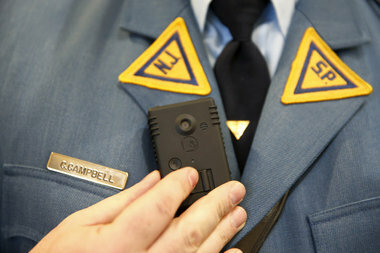 A bill that would require every uniformed officer in the state to wear a camera alsodied in committee amid concerns it amounted to an unfunded mandate. An estimate from the nonpartisan Office of Legislative Services (OLS) put the first-year price tag of outfitting the more than 35,000 officers in the state with the technology at $88.5 million. Nationally, some police departments have been temporarily shelving their body cameras as they grapple with data storage costs, which can burden small police departments who don't have the infrastructure to deal with the large video files and say they can't afford third-party storage services. The grants provided by the Attorney General's Office provide $500 for each body camera and related equipment. Elie Honig, the director of the state Division of Criminal Justice, called the use of body cameras an "investment" that "promises generous returns in the form of public confidence as well as savings in the resources devoted to internal affairs investigations." The Attorney General's Office said the first round of funding quadrupled the number of police departments in the state using body cameras, from 50 to about 200 of New Jersey's some 500 agencies. Under the new grant program, priority will be given to police departments that currently do not have any body cameras at all, as well as departments that meet other criteria including population and crime rates, according to Porrino's office.